Russian military early warning satellite. 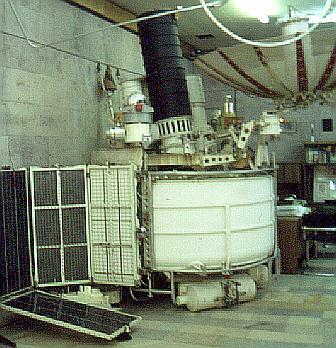 Development began of the Soviet Union's Prognoz geosynchronous ballistic missile early warning satellite in 1980. AKA: SPRN;SPRN-2;US;US-KMO. Status: Operational 1975. First Launch: 1975-10-08. Last Launch: 2012-03-30. Number: 16 . Gross mass: 2,154 kg (4,748 lb). It was required to fill in the gaps missed by the Oko series in 12-hour Molniya orbits. A single Prognoz deployed at 24 deg W, supplemented by several Okos in lower orbits, provided adequate warning of an American surprise missile attack. 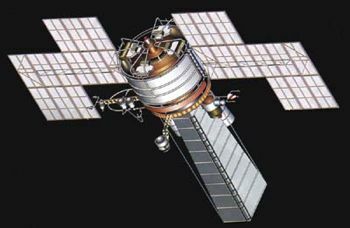 The first generation Oko system, even using a four satellite constellation in Molniya orbits, could not provide 24 hour observation of all possible launch locations. Therefore development began of a replacement system began in 1980. It supplemented the Oko satellites with Prognoz satellites in geosynchronous orbits. The system was accepted in to service in March 1985. This work completed the Unified System of Space Surveillance (YeSKN). In order to provide full time coverage of enemy missile launches a total of nine operational Oko and Prognoz satellites were required - four were needed to cover the US land mass alone. It seems this was never achieved in practice. Usually a single Prognoz was kept operational at all times at 24 deg W. Reserve satellites were stored at 80 deg E or 12 deg E and moved to 24 deg W as required. 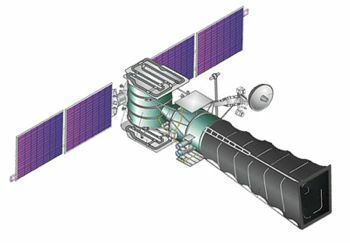 After the fall of the Soviet Union one active satellite was kept at 24 deg W and another at 12 deg E.
Family: Communications, Early Warning, Earth, Geosynchronous orbit, Military early warning sat, Surveillance. Country: Russia. Launch Vehicles: Proton, Proton-K/DM, Proton-K/DM-2, Proton-K/DM-2M DM3. Launch Sites: Baikonur, Baikonur LC81/23, Baikonur LC81/24, Baikonur LC200/40, Baikonur LC200/39. Agency: MOM, Lavochkin bureau. Bibliography: 107, 2, 274, 296, 4, 6, 67, 12976, 12977, 12978. 1975 October 8 - . 00:30 GMT - . Launch Site: Baikonur. Launch Complex: Baikonur LC81/23. LV Family: Proton. Launch Vehicle: Proton-K/DM. Cosmos 775 - . Payload: SPRN No. 1. Mass: 2,000 kg (4,400 lb). Nation: Russia. Agency: MOM. Class: Surveillance. Type: Early warning satellite. Spacecraft: Prognoz SPRN. Completed Operations Date: 1975-10-08 . USAF Sat Cat: 8357 . COSPAR: 1975-097A. Apogee: 35,853 km (22,277 mi). Perigee: 35,749 km (22,213 mi). Inclination: 14.90 deg. Period: 1,436.80 min. First launch of a prototype for a new geosynchronous ballistic missile early warning satellite. Exploded in orbit. The next launch did not come until nine years later, so this may have been a version of the Oko elliptical orbit early warning satellite. As of 29 August 2001 located at 113.71 deg E drifting at 0.044 deg W per day. As of 2007 Mar 10 located at 54.82E drifting at 0.255W degrees per day. 1984 March 29 - . 05:53 GMT - . Launch Site: Baikonur. Launch Complex: Baikonur LC200/40. LV Family: Proton. Launch Vehicle: Proton-K/DM. Cosmos 1546 - . Payload: SPRN No. 2. Mass: 2,000 kg (4,400 lb). Nation: Russia. Agency: MOM. Class: Surveillance. Type: Early warning satellite. Spacecraft: Prognoz SPRN. Completed Operations Date: 1986-10-01 . USAF Sat Cat: 14867 . COSPAR: 1984-031A. Apogee: 35,856 km (22,279 mi). Perigee: 35,709 km (22,188 mi). Inclination: 11.70 deg. Period: 1,435.90 min. Geosynchronous ballistic missile early warning satellite. Stationed at 24 deg W in 1984-1985; 80 deg E in 1986 As of 5 September 2001 located at 72.67 deg E drifting at 0.068 deg W per day. As of 2007 Mar 2 located at 81.39E drifting at 0.003E degrees per day. 1985 February 21 - . 07:57 GMT - . Launch Site: Baikonur. Launch Complex: Baikonur LC200/39. LV Family: Proton. Launch Vehicle: Proton-K/DM. Cosmos 1629 - . Payload: SPRN No. 3. Mass: 2,000 kg (4,400 lb). Nation: Russia. Agency: MOM. Class: Surveillance. Type: Early warning satellite. Spacecraft: Prognoz SPRN. Completed Operations Date: 1986-10-01 . USAF Sat Cat: 15574 . COSPAR: 1985-016A. Apogee: 35,773 km (22,228 mi). Perigee: 35,738 km (22,206 mi). Inclination: 6.50 deg. Period: 1,434.50 min. Geosynchronous ballistic missile early warning satellite. Positioned in geosynchronous orbit at 35 deg E in 1985; 24 deg W in 1985-1986 As of 5 September 2001 located at 151.95 deg W drifting at 0.251 deg E per day. As of 2007 Mar 3 located at 24.42W drifting at 0.038E degrees per day. 1987 October 28 - . 15:15 GMT - . Launch Site: Baikonur. Launch Complex: Baikonur LC200/40. LV Family: Proton. Launch Vehicle: Proton-K/DM-2. Cosmos 1894 - . Payload: SPRN No. 4. Mass: 2,000 kg (4,400 lb). Nation: Russia. Agency: MOM. Class: Surveillance. Type: Early warning satellite. Spacecraft: Prognoz SPRN. Completed Operations Date: 1991-11-01 . USAF Sat Cat: 18443 . COSPAR: 1987-091A. Apogee: 35,802 km (22,246 mi). Perigee: 35,776 km (22,230 mi). Inclination: 4.10 deg. Period: 1,436.20 min. Geosynchronous ballistic missile early warning satellite. Positioned in geosynchronous orbit at 24 deg W in 1987-1991 As of 5 September 2001 located at 165.32 deg W drifting at 0.190 deg W per day. As of 2007 Mar 9 located at 85.03W drifting at 0.375E degrees per day. 1988 April 26 - . 03:15 GMT - . Launch Site: Baikonur. Launch Complex: Baikonur LC200/39. LV Family: Proton. Launch Vehicle: Proton-K/DM-2. Cosmos 1940 - . Payload: SPRN No. 5. Mass: 2,000 kg (4,400 lb). Nation: Russia. Agency: MOM. Class: Earth. Type: Weather satellite. Spacecraft: Prognoz SPRN. Completed Operations Date: 1988-09-01 . USAF Sat Cat: 19073 . COSPAR: 1988-034A. Apogee: 35,764 km (22,222 mi). Perigee: 35,590 km (22,110 mi). Inclination: 9.00 deg. Period: 1,430.50 min. Given on Western lists as a geosynchronous ballistic missile early warning satellite. However not listed as such in Russian lists, and officially ...'conducted atmospheric, ocean studies. Investigation of the seas and oceans and the processes occurring in the earth's atmosphere'. So may have carried test instruments for second generation SPRN or had other purposes. Stationed initially at 12 deg E; Positioned in geosynchronous orbit at 24 deg W in 1988 As of 1 September 2001 located at 49.66 deg W drifting at 1.409 deg E per day. As of 2007 Mar 9 located at 70.52W drifting at 1.424E degrees per day. 1991 February 14 - . 08:31 GMT - . Launch Site: Baikonur. Launch Complex: Baikonur LC200/39. LV Family: Proton. Launch Vehicle: Proton-K/DM-2. Cosmos 2133 - . Payload: SPRN Generation 2 No. 1. Mass: 2,150 kg (4,730 lb). Nation: Russia. Agency: MOM. Class: Surveillance. Type: Early warning satellite. Spacecraft: Prognoz SPRN. Completed Operations Date: 1995-05-01 . USAF Sat Cat: 21111 . COSPAR: 1991-010A. Apogee: 35,795 km (22,241 mi). Perigee: 35,777 km (22,230 mi). Inclination: 0.50 deg. Period: 1,436.10 min. Geosynchronous ballistic missile early warning satellite. First launch of improved second generation version. Declared purpose: 'Investigation of outer space and of processes occurring in the Earth's atmosphere'. Positioned in geosynchronous orbit at 80 deg E in 1991; 24 deg W in 1992-1993; 80 deg E in 1993-1995 As of 2 September 2001 located at 80.48 deg E drifting at 0.009 deg W per day. As of 2007 Mar 10 located at 74.02E drifting at 0.040E degrees per day. 1991 September 13 - . 17:51 GMT - . Launch Site: Baikonur. Launch Complex: Baikonur LC81/23. LV Family: Proton. Launch Vehicle: Proton-K/DM-2. Cosmos 2155 - . Payload: SPRN No. 6. Mass: 2,150 kg (4,730 lb). Nation: Russia. Agency: MOM. Class: Surveillance. Type: Early warning satellite. Spacecraft: Prognoz SPRN. Completed Operations Date: 1992-06-16 . USAF Sat Cat: 21702 . COSPAR: 1991-064A. Apogee: 35,825 km (22,260 mi). Perigee: 35,781 km (22,233 mi). Inclination: 0.40 deg. Period: 1,437.00 min. Geosynchronous ballistic missile early warning satellite. Declared purpose: 'Relaying of telegraph and telephone information'. Positioned in geosynchronous orbit at 24 deg W in 1991-1992 As of 3 September 2001 located at 160.51 deg W drifting at 0.257 deg W per day. As of 2007 Mar 9 located at 94.69E drifting at 0.424W degrees per day. 1992 September 10 - . 18:01 GMT - . Launch Site: Baikonur. Launch Complex: Baikonur LC81/23. LV Family: Proton. Launch Vehicle: Proton-K/DM-2. Cosmos 2209 - . Payload: SPRN No. 7. Mass: 2,200 kg (4,800 lb). Nation: Russia. Agency: MOM. Class: Surveillance. Type: Early warning satellite. Spacecraft: Prognoz SPRN. Completed Operations Date: 1996-10-01 . USAF Sat Cat: 22112 . COSPAR: 1992-059A. Apogee: 35,790 km (22,230 mi). Perigee: 35,787 km (22,236 mi). Inclination: 0.40 deg. Period: 1,436.20 min. Geosynchronous ballistic missile early warning satellite. Stationed at 24 deg W. Declared purpose:'Investigation of outer space and of processes occurring in the Earth's atmosphere'. Positioned in geosynchronous orbit at 24 deg W in 1992-1996 As of 5 September 2001 located at 68.52 deg W drifting at 0.336 deg W per day. As of 2007 Mar 9 located at 171.17W drifting at 0.109E degrees per day. 1992 December 17 - . 12:45 GMT - . Launch Site: Baikonur. Launch Complex: Baikonur LC200/39. LV Family: Proton. Launch Vehicle: Proton-K/DM-2. Cosmos 2224 - . Payload: SPRN Generation 2 No. 2. Mass: 2,200 kg (4,800 lb). Nation: Russia. Agency: MOM. Class: Surveillance. Type: Early warning satellite. Spacecraft: Prognoz SPRN. Completed Operations Date: 1999-06-01 . USAF Sat Cat: 22269 . COSPAR: 1992-088A. Apogee: 35,806 km (22,248 mi). Perigee: 35,757 km (22,218 mi). Inclination: 4.80 deg. Period: 1,435.80 min. Geosynchronous ballistic missile early warning satellite. Stationed at 12 deg E. Declared purpose: 'Investigation of outer space and of processes occurring in the Earth's atmosphere. Prognoz series'. Positioned in geosynchronous orbit at 12 deg E in 1993; 24 deg W in 1994; 12 deg E in 1994-1999 As of 4 September 2001 located at 53.14 deg E drifting at 0.397 deg E per day. As of 2007 Mar 8 located at 142.40E drifting at 0.029E degrees per day. 1994 July 6 - . 23:58 GMT - . Launch Site: Baikonur. Launch Complex: Baikonur LC81/23. LV Family: Proton. Launch Vehicle: Proton-K/DM-2. Cosmos 2282 - . Payload: SPRN Generation 2 No. 3. Mass: 2,500 kg (5,500 lb). Nation: Russia. Agency: MOM. Class: Surveillance. Type: Early warning satellite. Spacecraft: Prognoz SPRN. Completed Operations Date: 1995-10-01 . USAF Sat Cat: 23168 . COSPAR: 1994-038A. Apogee: 35,817 km (22,255 mi). Perigee: 35,754 km (22,216 mi). Inclination: 1.86 deg. Period: 1,436.06 min. Geosynchronous ballistic missile early warning satellite. Positioned in geosynchronous orbit at 24 deg W in 1994-1995 As of 5 September 2001 located at 170.85 deg W drifting at 0.127 deg W per day. As of 2007 Mar 10 located at 58.90W drifting at 0.281E degrees per day. 1997 August 14 - . 20:49 GMT - . Launch Site: Baikonur. Launch Complex: Baikonur LC200/39. LV Family: Proton. Launch Vehicle: Proton-K/DM-2. Cosmos 2345 - . Payload: SPRN No. 8. Mass: 2,500 kg (5,500 lb). Nation: Russia. Agency: MO. Manufacturer: Lavochkin bureau. Class: Surveillance. Type: Early warning satellite. Spacecraft: Prognoz SPRN. Completed Operations Date: 1999-01-01 . USAF Sat Cat: 24894 . COSPAR: 1997-041A. Apogee: 36,504 km (22,682 mi). Perigee: 35,134 km (21,831 mi). Inclination: 2.60 deg. Period: 1,437.80 min. Geosynchronous ballistic missile early warning satellite. Positioned in geosynchronous orbit at 23 deg W in 1997-1999 As of 4 September 2001 located at 142.44 deg E drifting at 0.028 deg E per day. As of 2007 Mar 9 located at 66.03W drifting at 0.329E degrees per day. 1998 April 29 - . 04:36 GMT - . Launch Site: Baikonur. Launch Complex: Baikonur LC200/39. LV Family: Proton. Launch Vehicle: Proton-K/DM-2. Cosmos 2350 - . Payload: SPRN Generation 2 No. 4. Mass: 1,900 kg (4,100 lb). Nation: Russia. Agency: RVSN. Manufacturer: Lavochkin bureau. Class: Communications. Type: Military communications satellite. Spacecraft: Prognoz SPRN. Completed Operations Date: 1998-07-06 . USAF Sat Cat: 25315 . COSPAR: 1998-025A. Apogee: 35,793 km (22,240 mi). Perigee: 35,788 km (22,237 mi). Inclination: 2.10 deg. Period: 1,436.30 min. Geostationary at 73.0 degrees E. Positioned in geosynchronous orbit at 80 deg E in 1998 As of 3 September 2001 located at 72.67 deg E drifting at 0.041 deg E per day. As of 2007 Mar 11 located at 70.07E drifting at 0.036W degrees per day..
2001 August 24 - . 20:35 GMT - . Launch Site: Baikonur. Launch Complex: Baikonur LC81/24. LV Family: Proton. Launch Vehicle: Proton-K/DM-2. Cosmos 2379 - . Payload: SPRN No. 9. Mass: 1,900 kg (4,100 lb). Nation: Russia. Agency: VKS. Manufacturer: Lavochkin bureau. Class: Surveillance. Type: Early warning satellite. Spacecraft: Prognoz SPRN. USAF Sat Cat: 26892 . COSPAR: 2001-037A. Apogee: 35,810 km (22,250 mi). Perigee: 35,768 km (22,225 mi). Inclination: 1.60 deg. Period: 1,436.20 min. Launch delayed from August 23. Early-warning geosynchronous satellite. The Proton upper stage entered a geostationary transfer orbit after its first burn at 2152 GMT. 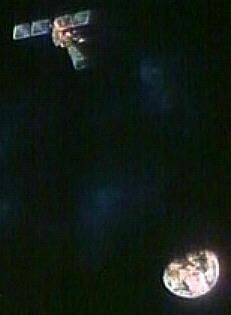 A second burn was at 0310 GMT put the payload into its operational orbit. It was to provide early warning of missiles launched from the United States with the help of a heat-sensing array of detectors. According to the Moscow Kommersant newspaper, these early warning geosynchronous satellites belong to the US-KMO group, also known as Prognoz fleet, while the highly elliptical complement belongs to the US-KS group, also known as Oko fleet, both supplemented by about eight ground-based radars. As of 6 September 2001 located at 80.17 deg E drifting at 0.031 deg E per day. As of 2007 Mar 10 located at 23.84W drifting at 0.002W degrees per day. 2003 April 24 - . 04:23 GMT - . Launch Site: Baikonur. Launch Complex: Baikonur LC81/24. LV Family: Proton. Launch Vehicle: Proton-K/DM-2. Cosmos 2397 - . Payload: US-KMO (Prognoz 2). Mass: 2,155 kg (4,750 lb). Nation: Russia. Agency: VKS. Manufacturer: Lavochkin bureau. Class: Surveillance. Type: Early warning satellite. Spacecraft: Prognoz SPRN. USAF Sat Cat: 27775 . COSPAR: 2003-015A. Apogee: 35,928 km (22,324 mi). Perigee: 35,886 km (22,298 mi). Inclination: 2.20 deg. Period: 1,442.30 min. As of 2007 Mar 9 located at 60.65W drifting at 0.723E degrees per day..
2008 June 26 - . 23:59 GMT - . Launch Site: Baikonur. Launch Complex: Baikonur LC81/24. LV Family: Proton. Launch Vehicle: Proton-K/DM-2. Cosmos 2440 - . Mass: 2,600 kg (5,700 lb). Nation: Russia. Class: Surveillance. Type: Early warning satellite. Spacecraft: Prognoz SPRN. USAF Sat Cat: 33108 . COSPAR: 2008-033A. Apogee: 35,799 km (22,244 mi). Perigee: 35,780 km (22,230 mi). Inclination: 2.10 deg. Period: 1,436.20 min. 2012 March 30 - . 05:49 GMT - . Launch Site: Baikonur. Launch Complex: Baikonur LC81/24. LV Family: Proton. Launch Vehicle: Proton-K/DM-2. Cosmos 2479 - . Payload: US-KMO 71Kh6. Mass: 2,600 kg (5,700 lb). Nation: Russia. Class: Surveillance. Type: Early warning satellite. Spacecraft: Prognoz SPRN. USAF Sat Cat: 38101 . COSPAR: 2012-012A. Apogee: 35,883 km (22,296 mi). Perigee: 35,692 km (22,177 mi). Inclination: 2.10 deg. Period: 1,436.20 min. Early warning satellite stationed in geosynchronous orbit at 80.1 deg E..